There can be few places where you can be so cut off so near to big towns and cities as Balsdean and Standean Bottoms and there can be few places where you can get such panoramic views in all directions, sea, downs and towns. The walk starts from Lewes centre. Buses 28 and 29 run back to Lewes from the finish. They go every 10 minutes on Monday to Saturday day times and every half an hour on Sundays. Brighton buses 22 and 52 go to the alternative ending of the walk. They go to Brighton from where you can get a bus back to Lewes. Get a saver ticket. This walks takes in valleys where it appears that you are miles from civilization, even though you are really near Brighton, Lewes and Falmer. 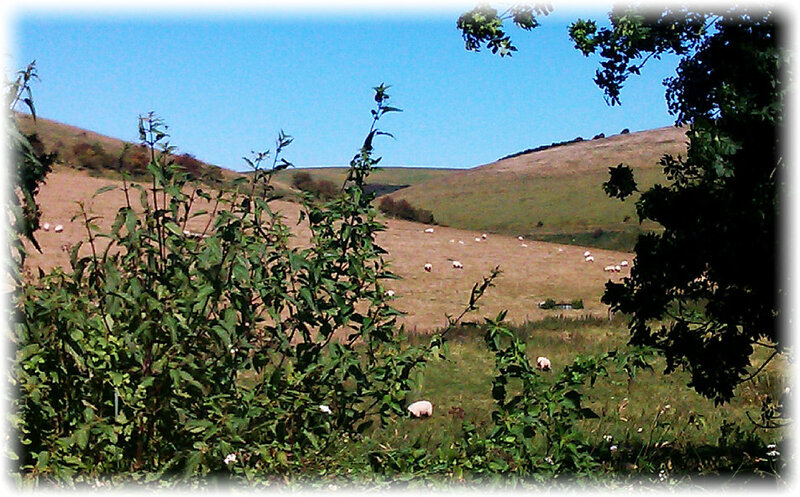 It also takes in some lovely South Downs Way views, while showing you what South Downs Way walkers are missing. Toilets at the bottom of Station Street Lewes. Shops, cafe’s and pubs in Lewes, including a number on the route. This route is stile free. If cycling you will need an all terrain bike. 1) The main bus stop in the upper High Street of Lewes is outside the Law courts if you are coming from the west and near the post office if you are coming from the east. Either way walk east to the traffic lights and turn right down Station Street. Be careful as the pavement is quite narrow. At the bottom keep straight ahead to the station. 2) Walk south from the main entrance to Lewes station (left if you are coming from the train)) If you missed to toilets on the station there are public toilets just to the north of the station, on the same side of the road as the station) Turn right at the mini roundabout, past a pub and historic Anne of Cleve’s House. Cross the road carefully. Traffic can be quick here and difficult to see Continue straight ahead past houses and bungalows with large gardens. Keep straight ahead here as the road turns into a chalk track. Go through a gate. Keep straight ahead. 4) The route opens out onto open access land. There are two clear chalk tracks. Take the left hand one and climb up to the ridge of the downs, with spectacular views on your left. 5) At the top you meet the South Downs Way. Turn left and then, after about 200 metres take a route to your right, descending into Balsdean Bottom. Continue until you come to some large and derelict farm buildings. A) These are all that remains of the hamlet of Balsdean. Once there was a Norman chapel, and two farms, one of which was used as an asylum at one point. Most of the buildings were blown up in the second world war for artilliery practice. Although you are actually very near the Woodingdean suburb of Brighton it feels as if you could be anywhere. As the Explorer map will show you, much of this is access land, where you can wander at will. Its a great place to spend all day. (B)To the north is Castle Hill National Nature Reserve. According to naturalist Dave Bangs 80% of England’s population of Wartbiter Bush-crickets live on the site. Turn left at the buildings and come to a group of trees. There are a number of tracks and a path fanning out here. Take the right hand track. This must be one of the most lovely and well engineered tracks on the Downs. 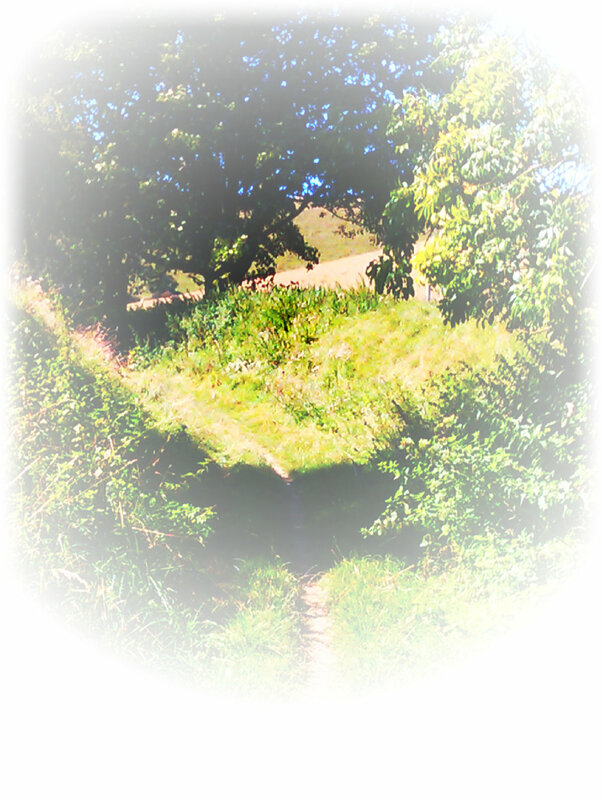 Follow it as it gradually ascends, climbing the sides of Standean and Falmer Bottoms. Finally arrive at the top and see Woodingdean and Brighton suddenly emerge. The city was there all the time but was hiding. Take a track that runs due west. 6) This track heads for the main road and a car park. But just before the car park another track comes in from your right, at a set of metal gates. It is possible to end the walk here. As you walked west along the first track you could see a road running parallel to the track at a lower level to the left. At the end of the road there are bus stops on each side of the road. On the south side is the stop for the 22 to Brighton and on the north side is the 52 stop for Brighton.The best way to get to the stops is to walk on to the car park, turn left at the main road, and then left again to get to the stops. 7) Come to a junction with signs showing that you have met the South Downs Way. Turn left here on the Way, which you follow for the rest of the walk. After about 200 metres there is a junction. Bear right, downhill, on the Way. 8) After a kilometre or so the you will find a gate straight ahead of you. Go through this and follow the route left and down a bank. At the bottom of the bankturn north-east and follow the field down to the railway. At the railway line turn left and then, after about 60 metres, turn right under the railway line. Turn left after going under the railway and continue west under the embankment. The path turns into a lane. Turn right down the lane to reach the bus stop to Brighton. For the bus stop to Lewes go straight ahead and then over the bridge which crosses the main road. Turn right at the end and descend to the cycleway. The bus stop to Lewes is behind you on the main road. To return by bicycle ride east on the cycle route to Lewes. You must rejoin the road on the outskirts of Lewes. To return to the station continue straight ahead until you reach the law courts on your left. Then turn right down the last turning BEFORE the traffic lights, down a very small road. At the bottom of the hill you will see the station just to your right.